Is "I-My-Mine-itis" Killing Your Business? I just spoke with a director of sales and marketing at a very successful high-tech firm. He wanted me to review 5 emails that his sales force has been sending to prospects. I asked him, "Which of these emails is producing the best results for you?" A quick glance at his marketing emails revealed several problems, each of which I can solve. Chief among them was a problem that undermines about 75-80% of the sales letters and marketing materials that non-copywriters create. Unless you're an experienced copywriter, it's probably wrecking your marketing materials, too -- and perhaps killing your business. The symptoms are a preponderance of I, my, mine, we, our, and ours in your marketing materials. Read any good sales letter and one of the most common words is always YOU. That's because any good copywriter understands human nature, and how natural it is to be selfish. We simply care about ourselves -- first and foremost. And, because your prospects are human, they care more about themselves and their problems than about you and yours. With that in mind, you can instantly improve any sales letter, email promotion, or web page by making one, simple change: Turn all mentions of I, my, mine, we, our, and ours into YOU, as much as possible. Example: Don't write, "Since our founding in 1997, we have diligently worked to deliver a complete service solution to our telecom customers, whether they be individuals or commercial entities." Write this: "You will benefit from our 14 years of experience solving every telecom problem you can imagine -- and some you can't." It took me 17 seconds to fix that. And I can do better. But do you see the difference? If you're going to write your own sales and marketing materials, proceed with caution. Use you, you, you, whenever possible. Because "I-My-Mine-itis" can be fatal to your marketing. I used to love that quote. Yes, time is precious and limited to only 24 hours a day. And, yes, how you use your time determines your results in business and in life. Yet ... while we all get an equal amount of hours in a day, not all hours are created equal. Some of us are morning people and perform at our peak before noon. Others are afternoon or evening people, and have more energy later in the day. Which means that not every hour has equal value. So, why not take advantage of your natural tendencies and schedule important tasks for when you have the most energy? This is like riding a horse in the direction it wants to go. If you don't know when your hours of peak performance are, find out. Carry a voice recorder (your smart phone has one) or small notebook and record those times of day when you feel energized, as well as times when you feel sluggish. Then, schedule your most-important activities during your peak-performance times. You will find that when you manage your energy effectively, the hours take care of themselves -- you will get more done and build your business faster as a result. Stop managing your time. Start managing your energy. If you're an entrepreneur, you know how important referrals are. Among the thousands of small business owners I've met over the years, referrals are usually their #1 source of new business, bringing in anywhere from 50% to 100% of revenue. Dozens of excellent books have been written on referrals, and I've read most of them. Here's the idea: Stop going after glasses of water (single referrals) and start digging wells (referral partnerships). According to Bear, average networkers ask for referrals. Master networkers ask for referral partners. Let's say an average networker asks for one referral to a new client every week; about 4-5 every month. With a closing ratio of 50%, in a year they get 26 new clients. Now let's say a master networker asks for introductions to a specific referral partner every week; about 4-5 every month. With a closing ratio of 50%, they get 26 new partnerships in a year. However, each referral partner sends 4 new clients every year to the master networker, which works out to 104 new clients. What does a referral partnership look like? Think of an orthodontist. How does s/he typically get new patients? Through referrals from a dentist, who sees kids before they need braces. Dr. Cindy the dentist typically tells a parent, "Your child needs braces. I recommend you see Dr. Bob the orthodontist down the hall. I send all my patients to him." The parent thanks Dr. Cindy for the referral, and will almost certainly give their business to Dr. Bob. Hint: You want to be in Dr. Bob's position -- with referral partners sending you qualified prospects. Action Step: Start asking for introductions to people who see your clients before you do. All you need are a half dozen solid referral partnerships to fill your calendar with qualified prospects. Of course, you must find a way to reciprocate, or the referral partnership falls apart. If you can't send business back directly to your referral partner, find somebody else who can. That way, everybody wins. Example: Dr. Bob the orthodontist can't send new patients to Dr. Cindy the dentist. But he can set up partnerships with real estate agents (whose clients need help finding a dentist), the pediatrician (who sees babies before they have teeth), and others. All it takes is a little imagination and effort. The rewards -- in the form of never-ending revenues from referral partners -- are worth it. Want to a build better business? Take your online conversations off-line. By that I mean do something tangible: meet for coffee (if local) or mail something (if distant). Yes, Twitter, Facebook, and emails are nice, but those are relationship starters. Online "touches" have little value as relationship builders. Example: Would you tweet "Happy Birthday!" to your mom ... and leave it at that? If you want to build a solid business relationship -- whether it's with a prospective client, vendor, or strategic partner -- do something tangible. I'm smart enough (I think) to know when I'm being bribed with a gift or a one-size-fits-all card. But this is not one of those. Because Dee took the time to include a nice note with her box of cookies. And her comments show that she did read my free Guaranteed Marketing report and the bi-weekly "Inside Marketing" newsletter that goes with it. It may have taken her all of 10 minutes to read my materials, but that's 10 minutes more than most people spend. Sending cookies doesn't hurt, either, but it's not necessary. And a gift may offend some people ... or get dunked in a bucket of water first, out of paranoia. Bottom line: Be like Dee. Go all out to go off-line with your online conversations. I got pulled over by the cops on Friday night, near my home in suburban Minneapolis. A few minutes later, I was let go with a warning and no ticket -- despite driving with a headlight out and no proof of insurance in the car. This pushes my lifetime record in traffic stops to 3-0 (knock on wood). Am I some sort of fast-thinking, smooth-talking expert at talking my way out of traffic tickets? Do these 3-5 things, then watch the cop's expression in your mirrors. S/he will visibly relax or even smile as they approach your car (I've seen them do both). More cops are killed during traffic stops than any other police function. In a police officer's mind, a traffic stop is more deadly than a bank robbery, a domestic dispute, or even a bar brawl. Cops are trained to approach every vehicle with extreme caution. And they stress like hell over this. So, as soon as a cop looks into your car (through the open window) and sees there's no gun in the glove box or your hands, their fear is largely removed. Remove fear and stress from the cop's mind and you stand a better chance of being let go with just a warning, all things being equal. Heck, it's happened to me three times now. Which leads to the marketing lesson: If you set the stage correctly -- to remove fear and stress from your prospect's mind -- it's easier to talk your way into a sale, like talking your way out of a ticket. There's a reason referrals are the easiest sales to make -- your prospect trusts you. Also, you're more confident. That's a winning combination. 2) Make a friend before you make a sale. This is great advice I got from copywriting legend, Gary Bencivenga. Do what it takes to build rapport with the prospect. As Dale Carnegie would advise: smile, be genuinely interested, and talk in terms of your prospect's desires. Still stumped? Just be useful. By offering a money-back guarantee, you remove fear and look more professional. Another winning combination. Yes, you will give refunds. But if your sales double, will you really care? Best part: Setting the stage properly -- whether it's for a conversation with a police officer or a prospect -- is 100% within your control. Funnel Vision Marketing: Free Toy Inside! ingredients (organic to super double organic). Hard to sort through those dozens of choices. 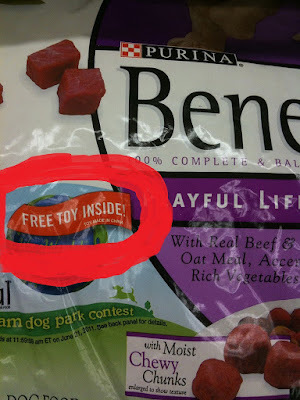 But this was the only dog food with a Free Toy Inside. It was in a category of one. Very easy to sort through one choice. This is a fine example of Funnel Vision, a concept I learned from Jay Abraham. Funnel Vision (the opposite of tunnel vision) simply means looking outside your industry for new ideas. 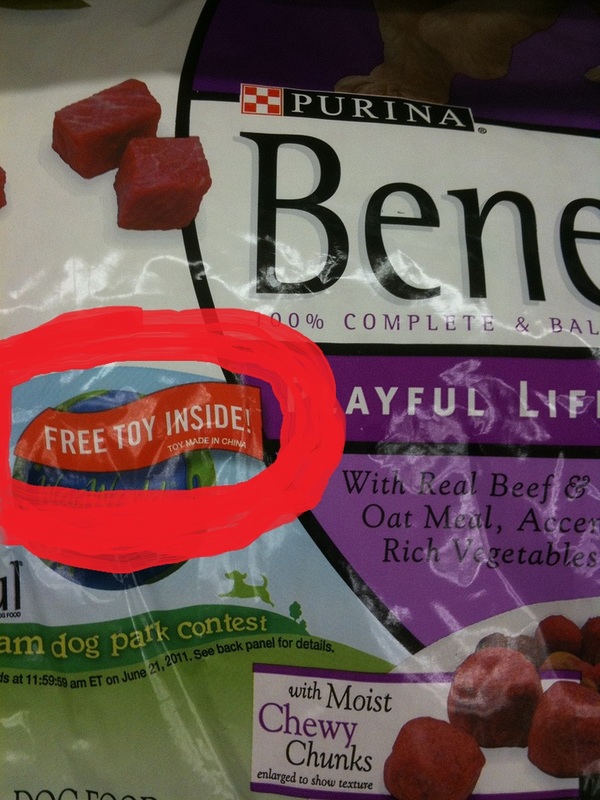 Like a dog food maker looking to breakfast cereals for the "new" idea of including a free toy ... while the competition beat each other up over ingredients or price. Because, really, there are no new ideas -- only new combinations of old ideas. So, where will your next marketing breakthrough come from? To find it faster, look outside your industry and use Funnel Vision. "Be more useful to more people." Do you agree or disagree with this marketing strategy? If you agree, then the tactics should reveal themselves. If you disagree, please share your strategy -- I'd love to see it! In Principles of Marketing , Philip Kotler and Gary Armstrong offer ideas on marketing a product that also apply to marketing a service. Specifically, their Augmented Product concept explains how one seat on an airplane can cost $18,000 -- with applications you can use to increase sales of your service. Level 1: Core Product. What intangible benefit(s) does your product offer? Example: Customers who buy a car are really buying transportation and convenience. Level 2 Actual Product. This is the physical item. With the car, it is the vehicle that you buy and drive home. Level 3: Augmented Product. What extra, intangible benefits can you offer to add value? Examples include outstanding service, worry-free guarantees, speedy delivery, bonus goods, etc. With these three levels in mind, take a look at the service you sell. How can you create an Augmented Version at a higher price, by adding extras with a high perceived value? For ideas, take a look at this article, describing the First Class service on Emirates Airlines. Checking In: "When you buy a first-class ticket Emirates sends a town car, and I get picked up around 8 p.m. for the 11 p.m. flight from JFK. The Emirates porters take your bags right from the car, wait for you to check in, and then they walk you to security, where there’s never a line. There’s a special lounge from which first and business passengers can board the plane directly, so there are very few people -- it’s empty." Pre-Flight: "The Emirates lounge at JFK is ridiculous -- it’s big, clean, everyone’s friendly. My first flight, I took pictures of the bathroom to send to my family. And there’s great food. I wait until I get there to eat dinner. In Dubai there’s a separate first-class lounge that’s even nicer." Not a Seat -- a Suite: "I boarded, got to my suite, and the bed, which goes completely flat, is big! The suite has noise-canceling headphones and a minibar with water and Diet Coke. I changed into the pajamas they give you and closed myself off -- it’s like being in your own bedroom." The Amenities: "I always take the amenity kit because I like the little jackknife brush comb, and the pajamas -- brown sweatpants and a sweatshirt -- are great workout clothes." What do those extras add up to? Emirates’ round-trip fares from JFK to Dubai are around $2,000 for economy ... and $18,000 for first class. How can you augment your service? Start thinking -- and adding -- today. Want to turn more prospects into clients for your business? Start selling better. And a simple way to do so is to script your sales conversations. By scripting, I mean using proven responses to tough objections, like: "I can't afford it," or "I want to think about it." "I don't want to read from a script and sound like a telemarketer," you think. Or, "I have to be flexible with every caller," or "My business is different." Any objections to sales scripts are nonsense. Because you're already using them -- right now. Why keep winging it by failing to plan your answers? There's no valid reason not to use a proven sales script, whether it's on the phone with a prospect or in person. And if you're worried about sounding stiff, like a bad telemarketer, here's a simple solution: practice your scripts, just like an actor. I was speaking to a prospect for my resume service years ago who sounded ready to buy ... until he said: "I want to think about it." I had heard that before. You, too? But, because I had heard that one -- and answered it -- before, I looked down at my script and replied: "Two heads are better than one. Why don't we think about it right now?" It turned out that he was concerned about price. I told him about my payment plans and money-back guarantee. He was sold, right there on the phone, and gave me his credit card number. Now. I guarantee you he would have never called me back after "thinking about it." He would have been poorly served by choosing one of my inferior competitors or trying to fix his problem alone. And I would have been out one sale. Sales scripts can pay you back. Big time. "Thanks to your outstanding sales coaching I snagged a reluctant Angie's List member. When I mentioned we do not charge diagnostic fees and just get to work, she was amazed. She then had ammo to ask competitors and found out our originally higher price was a real bargain ... even when compared to service providers within a mile of her house!" To create your own sales scripts, start writing down anything you've ever said to a prospect that closed a sale. Then, keep adding to your scripts as you develop new answers to tough questions. Practice your answers before making a sales call or whenever you have free time. Remember: You're already using scripts when talking to prospects by phone or in person, or when you're networking and giving an elevator pitch. So you might as well use a proven script. Write down and practice the words that sell, and you'll have a script for success in your business. If the subject of your email is not immediately intriguing, your email won't get opened and your efforts are wasted. Tip: I usually start an email subject with RE: so it appears to be a reply to something the recipient sent. Your email is never the only one in somebody's in-box; there are usually dozens more competing for attention. Only a few subjects begin with RE: so if yours is among them, your email stands out. And I never capitalize every word -- friends don't write email subjects like this: "See You At The Twins Game Sunday!" By "from" I mean ... who is the email from? If your "from" looks personal and non-commercial, your email has a better chance of being opened than a "from" from a business. Prove it for yourself -- which of the following emails would you be more likely to open? Do what it takes to configure your email so it appears to be from a real person and not a faceless corporation. Ideally, the content in your email should either offer news readers can use ("Here's what the latest jobless figures mean for you") or reference a breaking news story ("Were you affected by those tornadoes on Sunday?"). The more timely your news reference, the higher your readership and the better your response will be. Tip: Certain news stories occur with regularity, such as the Bureau of Labor Statistics monthly job reports. Write your email promotion to tie into an event you know is coming up, then send it that same day. Another Tip: Anyone clicking through to visit your sales page ought to get value from simply viewing that web page, whether they buy or not. So, try to educate or share your expertise while you sell. The best-performing emails I've created in the last 17 years -- in terms of open rates, click-throughs, and sales -- had all three of the above: an intriguing SUBJECT, personal-looking FROM, and a NEWS angle. Mini Case Study: An email promotion with the SUBJECT "RE: LinkedIn" that was FROM "Kevin" got a 30% open rate among 7,472 recipients, with a 47% click-through rate to the sales page. Of those 1048 unique clicks, 4.7% purchased a $49 product. The NEWS angle? How people are using LinkedIn to find jobs now, despite the current unemployment rate. I hope you find these 3 tips useful in your email marketing! Of course, writing winning emails is something I do nearly every day. If you'd like me to create a money-making promotion for you, please look at my catalog of services. There's a well-known company that I'm thinking about hiring for a project. I visited their web site. Many of the most successful performance marketing programs utilize a variety of extension strategies and cross-platform initiatives to reach long- and short-range targets. Do you have any idea what they do, make, or sell? Neither did I, after the first, second ... or third reading (and I have 1.75 college degrees. Sheesh). Luckily, I am determined to talk to somebody at this company, at least to find out if there's a human being on the inside. Now. Your web site may not be this badly marred by buzzwords ... but you never know. In fact, you yourself really can't know for certainty if you're speaking the language of your prospects. Because you are not your prospects. So, try this: Find 5 people. Not friends or family -- find 5 new acquaintances. 1) What does this company do? 2) At first glance, do they look trustworthy? Why or why not? 3) Please try to order something, right up to submitting payment. What, if any, problems or questions did you have? *) Bonus question: Visit this webs site on your mobile phone browser. What's your first impression? I'm sure you could add to the list. Whatever questions you ask, your goal is simple: Find out if your web site is written in the language your prospects speak and understand. Here's a simple way to grow your business that costs $0 and never fails to work. It's this: Find out where your money is coming from, and do more of that. I told you it was simple. Yet, it's also incredibly powerful. First, answer this question: What 3 things do you do that cause clients to buy from you? Next, track your time for a week, from the minute you wake up until you quit work at night. How do you spend every minute of every working day? This is your Work Diary. You can keep your Work Diary in an Excel spreadsheet, a text file in your computer, or a little notebook in your back pocket. Then, at the end of the week, analyze your Work Diary. How many hours per week did you spend on each of your top 3 revenue-producing activities? How many hours on non-revenue producing activities, like running errands, checking email for the 5th time, checking ESPN.com, etc.? The numbers don't lie. I PROMISE you this exercise will deliver surprises and insights galore. Example: In my case, even though referrals bring in 40% of my revenues, I found I had spent only 55 minutes last week talking to my clients and business partners to stimulate referrals. Not good. Next, plan the week ahead and schedule twice as much time for your top 3 revenue-producing activities as you spent on them the previous week. Where can you find the time? Take a look at your Work Diary again and "rescue" time from non-revenue producing activities, like answering email, cleaning your desk, etc. This idea is so simple it's easy to dismiss as ... too simple. But dismiss it at your peril. Because I've used it to double revenues for three businesses, including one 6-month span when I quadrupled revenues for one business. When you see on paper that, "Wow! I spent 16 hours last week responding to email!?" it's very easy to then think, "Hey, I can rescue 5 hours this week for more networking by spending less time on email each day." A few daily tweaks can add up to bigger weekly paychecks for you, when you do more of what pays and less of what doesn't. In business, you must differentiate or die. To succeed, your product or service must stand out in a crowded marketplace. Otherwise, you go unnoticed and starve. How do some of the most successful companies differentiate? Think of Zappos. They sell a commodity -- shoes. So it's not their product that's special. And their prices aren't low -- you'd pay less at Wal-Mart. What differentiates Zappos? The same thing that differentiates Nordstrom, The Ritz Carlton, L.L. Bean, and many other successful companies -- service. Specifically, heroic service that prompts repeat and referral sales. Few people talk about the shoes from Zappos or the ties at Nordstrom. But everyone talks about the service. 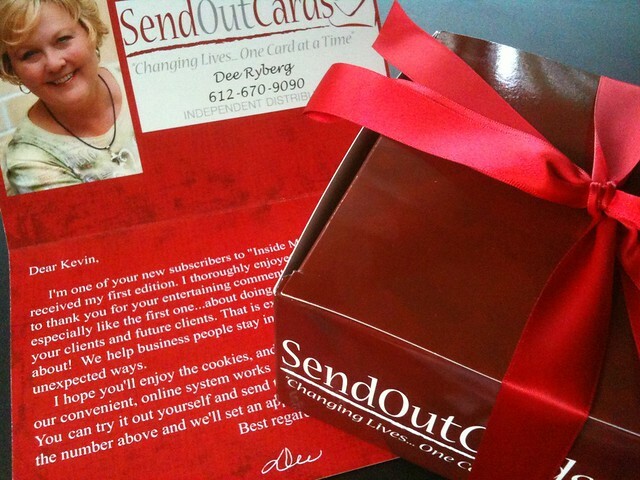 Small business example: my printer -- Jim Beckman, at Full Throttle Print & Imaging in Chanhassen, MN -- got a panicky call for an order of business cards at 7:00 on a Friday night ... and he delivered it to the client's home the next morning, Saturday. That's heroic service. And it gets people talking. Client and others -- like me -- have told that story again and again, like the stories of the FedEx employee who chartered a plane to deliver a wedding dress, or the Nordstrom employee who refunded a set of snow tires (which Nordstrom doesn't sell). If you must differentiate or die, and you don't have the best products/services or the lowest prices, that leaves service at the one area where you can gain a competitive edge. You can start today, too, by delivering service that delights and surprises clients. Service may be the fastest and most profitable way for you to differentiate. It sure beats the alternative.